Some SMS Gateways allow you to “poll” their server for any replies to messages sent from a shared virtual mobile number or a dedicated virtual mobile number. 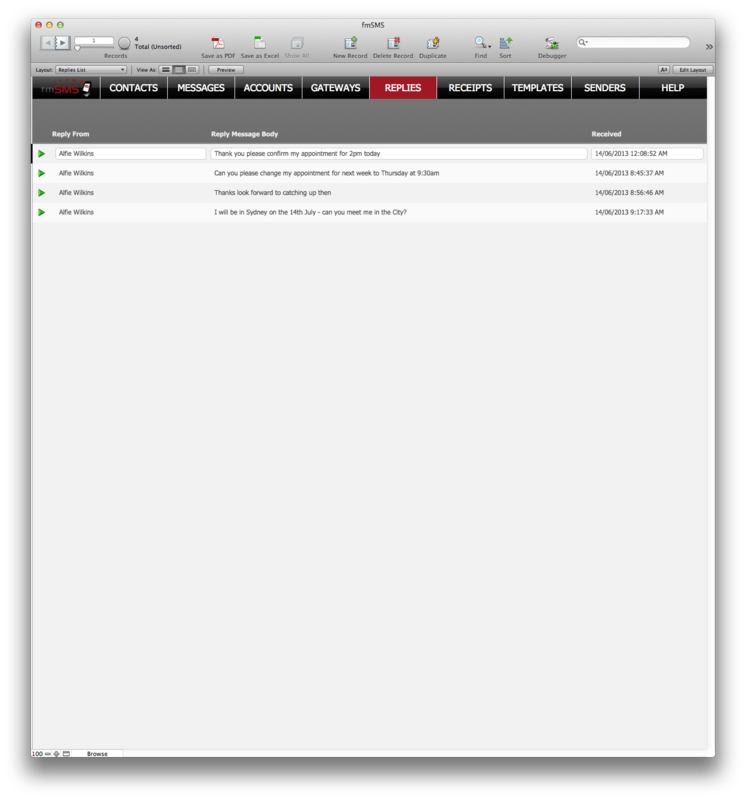 This requires manual intervention – someone needs to click the Incoming Messages button in the Account details screen to initiate this process. This method is supported when fmSMS is hosted/opened in FileMaker Pro or hosted by FileMaker Server. 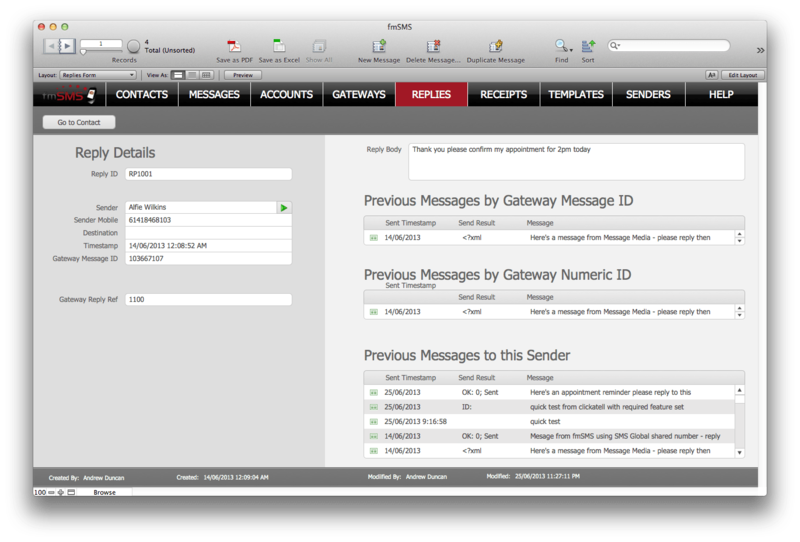 Most SMS Gateways that offer 2 way messaging will have an option to “push” incoming messages to you automatically in a similar way to how automatica Delivery Receipts are delivered. This is also our preferred method, but it does require that fmSMS be hosted by FileMaker Server and that you configure the Customer Web Publishing service. A static IP address is also recommended as you have to provide the SMS Gateway with a URL to a php page on your server. We provide the necessary PHP pages that convert the incoming message into a record in the Replies table in fmSMS. Some Gateways charge additional fees to use this feature and if you require a dedicated virtual number you will need to rent/purchase one through your SMS Gateway. To manually check for new Replies in fmSMS (where supported by your SMS Gateway) click on the ACCOUNTS button at the top of the screen to view your list of Accounts. Click the green arrow button to view the details for the Account you wish to check for new replies, then click the Incoming Messages button (if the SMS Gateway associated with this fmSMS Account does not support manually checking for replies you will receive an alert). fmSMS will then communicate with the SMS Gateway via one of the supported methods (HTTP POST or XML IMPORT), check for any new replies since it last checked and then download any awaiting replies. FileMaker Cloud Compatibility – if you’re using FileMaker Cloud to host fmSMS you will not be able to automatically receive incoming messages using the supplied PHP pages as FileMaker Cloud does NOT support Custom Web Publishing with PHP. where [drive] is the drive on which the Web Publishing Engine component of your FileMaker server deployment resides. N.B. the HTTPS options require a valid SSL certificate to be installed. If you are using FileMaker Server v17 you cannot using the FileMaker Server Admin Console to enable Custom Web Publishing using the PHP API. You will need to use the Command Line Interface to enable these – see the FileMaker Server 17 Help for more information on these commands. Once you have determined the URL to the dedicatedNumberReply.php and/or sharedNumberReply.php files you then need to update your account settings with your SMS Gateway to enable the automatic Replies option and provide the URL to these pages so they can sent the Replies for shared/virtual numbers to these pagse (these will then be converted into records in the Replies table). If you have a dedicated virtual number with Clickatell you can enable the automatic delivery of Replies to your hosted copy of fmSMS – Clickatell don’t support 2 way messaging with their shared virtual numbers. N.B. the Clickatell Americas Small Business API (Two-way) service includes a dedicated virtual number as standard. If your preferred SMS Gateway is not listed here please let us know – we can easily modify the dedicatedNumberReply.php and sharedNumberReply.php files for additional SMS Gateways that support this feature.